Allow the yeast to soften in the warm water. Next add the flour, brown sugar, molasses, 1 tablespoon oil, and salt and mix till it comes away from the sides of the bowl. Turn out onto a lightly floured surface and knead till the dough becomes smooth adding flour as needed. This dough is much softer than bread dough. Ball dough and place into clean, lightly greased bowl, turning the dough ball to evenly coat all sides. Cover and allow to rise roughly 1/2 hour. This dough does not need to be punched down. Divide into thirds (I use a scale for equal portions), then divide those thirds into thirds again. Roll the dough into long ropes (slightly longer than 2 foot). Form a horsshoe with the rope then cross the ends and fold back over the round. Place each finished pretzel on a lightly greased baking sheet and then cover and allow to rise for roughly 30 minutes. Next combine the baking soda and water and heat to extremely hot but not boiling. After the second rising of the pretzels, dip them in the baking soda water 1 at a time. Use a slotted spoon or skimmer to flip them then move them to a greased baking sheet. The pretzels will then bake for roughly 10 minutes at 450 degrees (turning after the first 4 or 5 minutes). When done pull from oven and allow to cool for a minute or two. Combine the 4 tablespoons melted butter with the rest of the oil into a shallow bowl. Remove the pretzels from the baking sheet and dip each side into the butter mix then cool the rest of the way on a wire rack. This recipe is one of the many great recipes you can find in the book Secrets of a Jewish Baker. If you love making fresh bread it is well worth it to pick this one up. 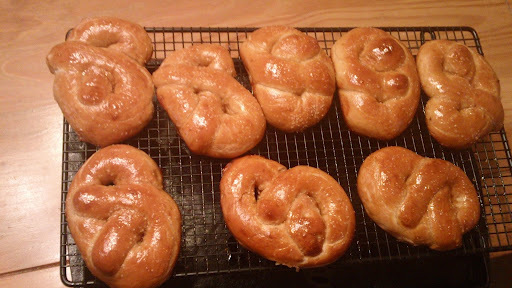 4 Responses to "Soft Pretzels #realfood"
These are so much better than mall pretzels. I LOVE soft pretzels. These look wonderful, Jon. I’ve been trying to find molasses in Germany, but I don’t know what they call it. I wonder if you can use hot baking soda for other types of breads. Awesome! Thanks for sharing. The baking soda and water technique is also something used for bagels. It’s the boil that gives them their crunchy exterior and chewy interior.